She's guarding his body. He's guarding his heart. Hostage negotiator Lauren Miller is used to staring danger in the face. Now a vengeful former team member is targeting her and anyone she cares about, including her ex-husband. Although hiding them both in the same remote safehouse is risky, the plan could provide her with the perfect opportunity to make amends with the one man who has her heart. Building Hauberk Protection into a success is the only thing that's kept Chad sane since his marriage ended. He loved Lauren more than life itself and losing her left a hole that haunts him still. When he unexpectedly finds himself trapped with her, Chad can think of only one up-side-he can finally learn why she walked away without an explanation. Except the heat that burns between them is turning their defenses to ash. As their passion rekindles, Lauren struggles to keep her focus. Especially when she learns that Chad wasn't the only one being deceived. 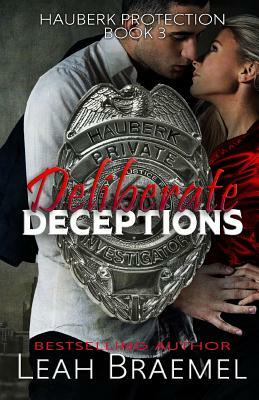 And those deliberate deceptions put both their lives in jeopardy. Warning: Tie-me-up, hold-you-down, no-frontiers-unexplored action could raise internal temperature. Please keep flammable materials at a safe distance while reading. Virtual cases of tissues included, and HEA guaranteed. Also contains PERFECT PROPOSAL, a Hauberk Protection short story, for the first time ever in print. Books 3 and 3.5 of the Hauberk Protection series.